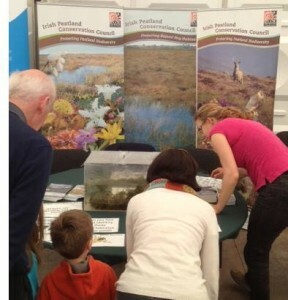 From the 18th – 26th May Ireland celebrated National Biodiversity Week. This week aimed to raise awareness for the many different types of plant and animal species found in habitats around Ireland. 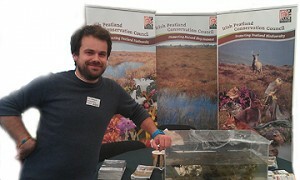 On Sunday the 19th of May the Bog of Allen Nature Centre was open for visitors to explore and learn about peatlands. Before visitors arrived staff at the centre saw a young hare in the wildlife gardens and although younger visits on the day tried to discover the hares resting place it was to no avail. A visitors pond dipping session identified water boatmen, diving beetles, freshwater hoglouse, shrimps, frogs, newts and dragonfly larvae. A bog walk showcased for visitors some of the wonderful peatland plants such as bog cottons, Sphagnum mosses, sundews, lichens and heathers. Visitors also watched the Curlew fly over the bog throughout the afternoon searching for food. On Wednesday the 22nd the centre hosted a butterfly workshop where participants learned about the variety of butterflies in Ireland and while taking part in a butterfly walk identified the green veined white and speckled wood butterflies. A greater variety of butterflies can be seen at this time of year however it is essential the weather conditions are calm and sunny when searching for butterflies. Wednesday the 22nd was quite overcast with a moderate breeze keeping butterflies resting on plants. On the 25th and 26th the Irish Peatland Conservation Council showcased their new biodiversity pop up displays at the Native Species weekend at Dublin Zoo. The IPCC would like to acknowledge the support received for these events from the Department of Environment, Heritage and Gaeltacht through their Notice Nature Campaign, Ireland’s public awareness campaign for biodiversity. If you missed out on these events don’t worry, the Bog of Allen Nature Centre has loads more great biodiversity events throughout the summer including a biodiversity walk around Lullymore Island on the 21st July, IPCC’s Gathering weekend offers a guided walk on Pollardstown Fen on the 27th July and celebrates International Bog Day on the 28th July, from 29th July – 2nd August the Bog of Allen Nature Centre will be hosting its Wet and Wild Nature Camp for young explorers of biodiversity and on the 18th August the centre will enjoy a Heritage Week Open Day. So lots more to enjoy over the summer months at the Bog of Allen Nature Centre. This entry was posted in News and tagged Activities, biodiversity, Bogs, Events, IPCC, Ireland, Kids, open day, Things to Do, visitor. Bookmark the permalink.